Nine tiger and two leopard cubs were receiving round-the-clock bottle feedings as they recover following their rescue from a home where authorities also found 90 dead tigers, including 58 cubs stuffed into a freezer. The 11 living cubs were dehydrated and one had a bad case of mange when they were brought to the Fund For Animals Wildlife Rehabilitation Center in San Diego County, but their conditions were improving Thursday, said Charles Traisi, who heads the center. The rescued animals, which also included two healthier cubs, were found Tuesday during a raid at a home connected to a nonprofit animal sanctuary, authorities said. Two alligators also were found at the Riverside house. John Weinhart, who runs Tiger Rescue and had previously been accused of improperly caring for tigers, was arrested along with his wife, Marla Smith, and the couple's veterinarian, Wendlin Ringel. Weinhart and Smith were booked for investigation of child endangerment because the alligators and the 13 live tiger and leopard cubs, ranging in age from 10 days to 7 months, were found at the home where their young son lives. The two each posted $15,000 bail and were released. Ringel, who was arrested for investigation of animal cruelty, posted $5,000 bail and was released. The three were ordered to return to court for a May 21 arraignment. "I'm 61 years old. I've never seen anything like this in my life and I hope with a little bit of luck, I never have to be exposed to anything like this again," Traisi said in a phone interview from the rehabilitation center in Ramona, located about 35 miles east of San Diego. The Los Angeles Times said a conflicting picture of Weinhart emerged from interviews with those who knew him or were familiar with his operation. 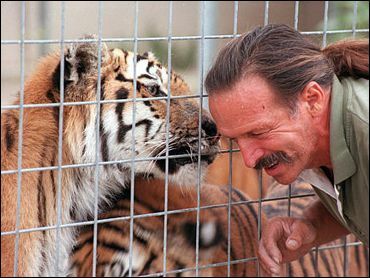 To some, Weinhart was known as Tarzan - a man with a special feel for big cats. An employee said Weinhart could walk into a pen of leopards, where the cats would fight with each other to rub up against him. But others had a different view of Weinhart. Natalie Paulson, the director of animal welfare at a sanctuary in Los Angeles County, told the Times she called the USDA to complain following a visit to Weinhart's Tiger Rescue operation last summer. "It was horrendous," Paulson told the newspaper. "All the animals were malnourished — no water, no shelter from the elements or shade; there was an African lion fully grown that was in a box with no water or shelter. ... Everything was so dirty. Some of the tigers were infested with fleas." The surviving cubs taken from Weinhart's home will eventually be placed at large cat sanctuaries. The alligators will remain with Riverside County's Animal Services Department until a suitable habitat can be found. Weinhart and Smith did not return a call to their home Thursday night. Ringel's attorney, Kristine Burk, said her client has never been inside Tiger Rescue and had no knowledge of the condition of the animals there. "She has never seen animals there. She has never treated animals at that location. She had no idea what was to be found at that location," said Burk. "She's shocked, sickened by the footage she's seen." Weinhart, who is licensed by the state to keep tigers and other big cats, is scheduled to stand trial next month in San Bernardino County on 10 misdemeanor charges stemming from what prosecutors say was improper care of tigers. Fish and Game investigators raided the Riverside home Tuesday following an anonymous tip that Weinhart was keeping a tiger cub and alligators there. A spokesman for Tiger Rescue, a refuge for former animal performers, has said all the animals were cared for properly. Jeffries said the dead cubs were kept frozen so tests could be conducted to determine how they died. Animal Services spokesman Ralph Rivers said it will be impossible to determine what killed the animals because of their advanced state of decomposition.